As viewers know, last week’s Thrones left three main characters in mortal limbo, while summarily offing a couple others. This week, Leo Garcia sits atop our temporary Iron Throne, with $160—though others are close behind. It’s just week three, but maybe this is when the big direwolves will really start to separate from the rest of the pack. Eckstein the oddsmaker says: She’s the biggest favorite we’ve ever had. Take your kids’ college fund and bet on this. She’ll be killed by Cersei in front of her mother. The A.V. Club says: It’s shocking she’s not dead already. Eckstein the oddsmaker says: She’s not long for the world. The A.V. Club says: We can’t argue with that. Eckstein the oddsmaker says: They’re going to keep her around for maybe another episode or two, but obviously she has to go. Cersei will do something really evil to her in this next episode, I think. The A.V. Club says: While Cersei’s evilness is certain, whether she’ll actually off Ellaria this episode is, as Eckstein says, certainly a question. She could keep Ellaria around just to torture, à la the shame nun. The A.V. Club says: The dude has become lovable—even though Arya removed him from her kill list, what if she accidentally kills him? She’d feel really bad. Sounds like a good plot point. Eckstein the oddsmaker says: He has no magic. The A.V. Club says: Say it ain’t so. Davos has our hearts. Eckstein the oddsmaker says: After last week with Missandei, he really has nothing to live for. The A.V. Club says: What about love? He has love to live for! Eckstein the oddsmaker says: Unlike Davos, Melisandre still has some magic. The A.V. Club says: That’s true. Maybe she’s served her purpose now that she’s hit Daenerys with that prophecy. Eckstein the oddsmaker says: Lord Tarly is one of the Tyrell’s bannermen, even if they’re now allied with the Lannisters. Dickon is going to die, as well as his father, and Sam is going to have to leave the maister program to go back and lead the Tarly army. The A.V. Club says: Sam’s a lover, not a fighter. That being said, it’s probably not a coincidence that the Tarlys popped up again last week. Eckstein the oddsmaker says: He’s got stuff to do, but Eckstein the oddsmaker cannot reveal it. I will say I promise it’s not fake news. The A.V. Club says: He could be in the action this week, we suppose. What will happen at the meeting between Daenerys and Jon? 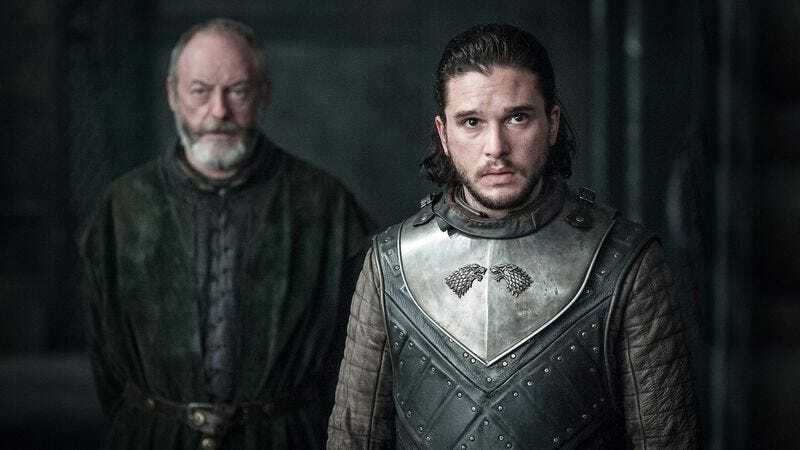 Over/under on how many episodes until Jon Snow’s true parentage is revealed to him: 5.5. 2-1 Euron’s gift to Cersei will be one of the Sand Snakes. 3-1 The gift will be The Dragonbinder, a horn that the Valyrians made to bind dragons to the holder’s will. 4-1 The gift will be Lady Olenna Tyrell. 5-1 The gift will be an Ice Dragon. John Teti ($130): $20 on Grey Worm and $30 on the field. Karl Blomberg ($130): $10 on Ellaria Sand, $10 on Jon and Danny pledging to unite. Emi Tolibas ($125): $35 on Tyene Sand, $35 on the field. Danette Chavez ($90): Is out of town and behind, so forgoes betting this week. Erik Adams ($80): $30 on Ellaria, $20 on Tyene, $10 on Yara, $10 Jon and Dany unite. Grace Thomas ($60): $15 on Grey Worm, $20 on Yara, $5 on the under for the field and $5 on Jon and Daenerys pledging to unite. Caity PenzeyMoog ($60): $5 on Grey Worm, $5 on Ellaira, $5 on Tyene, $5 on Melisandre, $5 on uniting, $5 on the over, $5 on the field. Alex McLevy ($55): $10 on Daenerys and Jon uniting, $10 on Yara, $10 on Melisandre.